About two years ago, Micheal mentioned that he had purchased some wine at Grocery Outlet, per the suggestion of a colleague who was a wine writer in a former life. Being a young and "somewhat snooty" wine connoisseur at the time, immediately visions of Charles Shaw and Robert Mondavi Private Label flashed through my head. I recall seriously questioning Micheal's judgement at that time and in fact, he was almost excommunicated from the ranks of The Oregon Wine Blog as a result. As usual, when I'm being a snob about something, I'm usually wrong - and this was certainly no exception. It just took a few years for me to come to that realization. In October I was attending a meeting in Yakima with Clive, and one night after our meetings he cracked open a Syrah from the Yakima Valley that I particularly enjoyed. Upon polishing off the bottle, I inquired as to it's origin. Grocery Outlet was the source. Clive shared that he buys wine by the case there, and you'd be a damn fool if you didn't. The proof in my belly, I reconsidered my reticence for bargain shopping. You see, what I failed to consider was in fact the genius of the business model of Grocery Outlet -- capitalize on the overload of better wine in the supply chain right now, grabbing it at a deep discount which is passed on to customers. Based out of Berkeley, California, Grocery Outlet has over 130 locations in all of the Western states frequented by TOWB staff. Initially offering a selection of wine from newer producers, the current economic state of the US has allowed Grocery Outlet to offer some older, better established wines at 50 - 70% off of normal retail price. An aside about the economy for a moment...you may have noticed we are still in a bit of a recession. In talking to winemakers over the past few months, a number have shared significant difficulty in moving some of the ultra-premium wine they produce -- think of the stuff over $35. This hit home for me when I was able to procure a bottle of Col Solare at Costco for a 33% discount. Point is none of us have the cash money to frivolously spend on wine, so why not find a value option for good juice? This is a serious issue in the industry right now, and Grocery Outlet has found a solution. Both wines were enjoyed by our guests, but the hit of the evening was the price point. $2.99 for a Merlot that tastes like a $12 bottle? Outstanding. I can see why Clive buys a case. As part of our research, we stopped by the local Grocery Outlet to see the offerings. 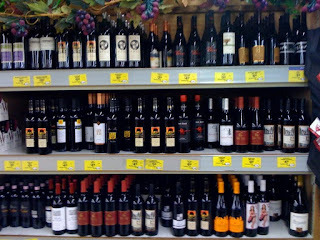 We found a larger than expected wine section, and while nothing was jumping out to us at that point in time, we saw many customers leaving very happy. It's the joy of the search, and with an ever-changing supply you never know when you'll walk through the door and find that gem. So I feel like I'm rambling, so I'll quit. In summary, try Grocery Outlet for some great value wine -- it will surprise you. Don't be a "damn fool." Best Grocery Outlet find of all time, I bought 3 cases of 03 Waterbrook Primarius Syrah for 3.99 a bottle. It was a limited release wine that was $34.00 a bottle. I haven't found anything quite that nice at the Outlet in a long time. Thought I did come upon some single vineyard HHH Roussane a short while ago for 2.99 a bottle. Not too shabby. What a great find! We have a Grocery Outlet down here as well so I might have to take a trip over there this week. Everything is great at the grocery outlet, I always tell people this is the best place to save money and find great finds. I love the wine selection there. Before my mother had kids, in a bigger city where Grocery Outlet was a ways away, she would take along a wine-opener and check the bottles in the parking lot. Then she knew which ones to go back in and stock up on, because stuff won't be there when you go back. Great review. 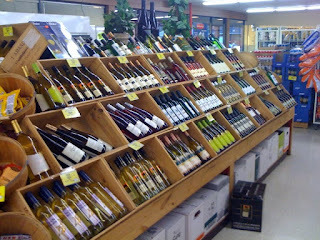 I linked your post to my blog post about GO upcoming wine sale!! Thanks so much!! !